I'm back with another +BornPretty Store Nail Art review post. 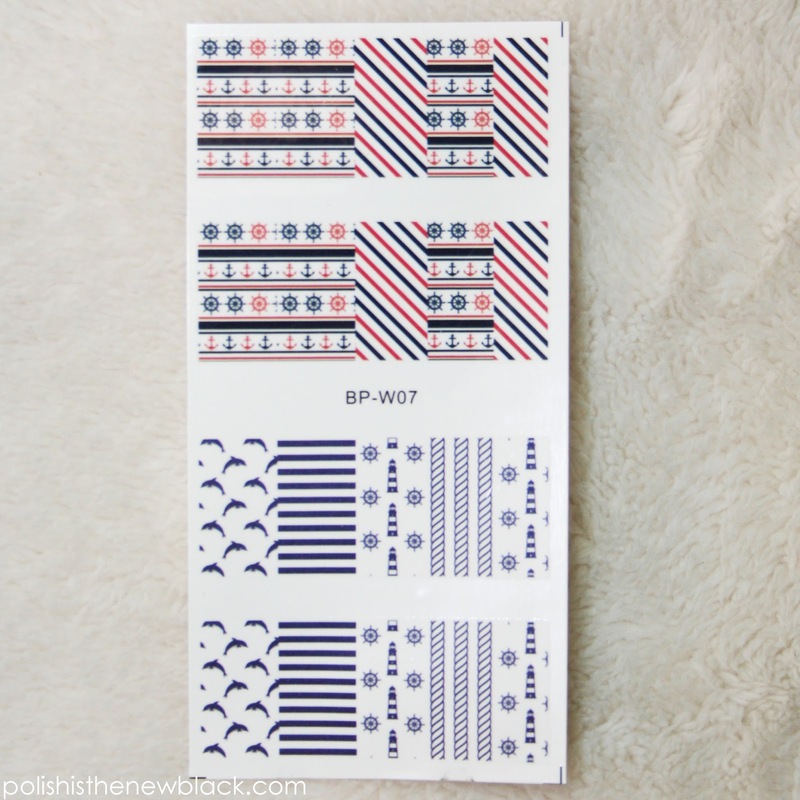 Today I'll be showing you these super cute nautical decals. This is my third review item; you can read my other reviews HERE and HERE. You can use my code 'PBW10' for 10% off your order! 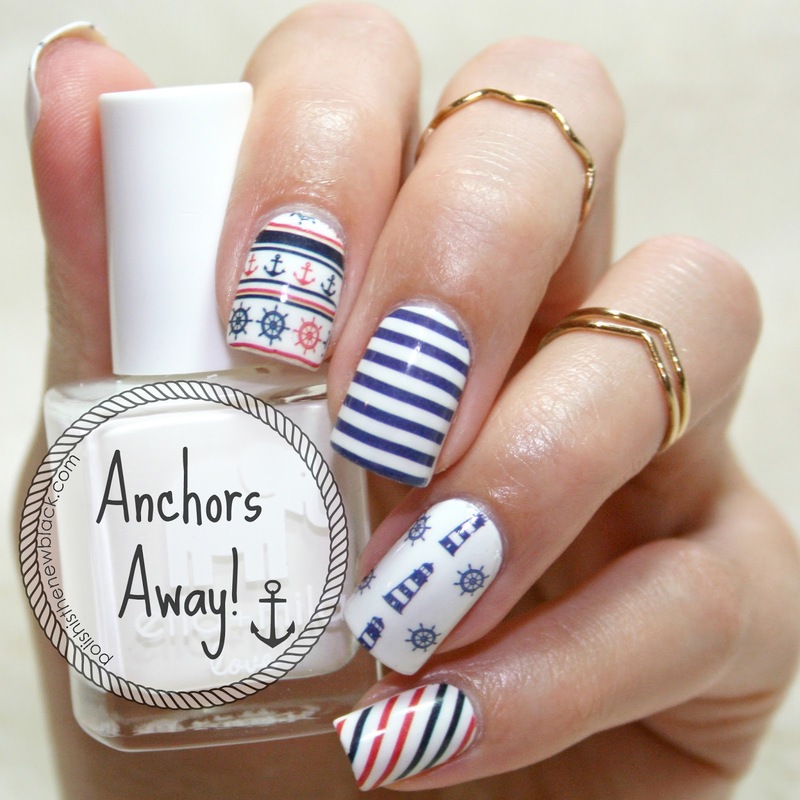 They are similar to a nail wrap since the design fits the entire nail but they apply like a nail decal! Such an amazing concept! Now for those of you who have used nail wraps before you'll know they can be really tricky to apply. I have always found water decals much easier so I was really eager to try these out. Nail wraps... Nail decals... What!?!? Now some of you may be wondering what I'm talking about. To put it simply a nail wrap functions like a sticker that covers your entire nail. They sound perfect but they can be very tricky to apply; usually you have to trim them to fit your nail and they often crease during application. A nail decal is a design printed on a very thin transparent film which is cut out, plunged into water and applied to the nail. Paint your nails your desired base colour (I went for Ella Mila Pure Love) and let them completely dry (I used a quick dry top coat to speed things up). Remove the transparent plastic - THIS IS VERY IMPORTANT! Plunge the design into water for a few seconds. Remove the design from the water and slide it off the backing paper. Apply to your nail and dry any excess water with a tissue. For me the designs were a little long so I trimmed them down. As you can see I mix and matched from the two designs for this look. I think they look so cute! They are definitely great for quick and easy nail art. The only trouble I had, is that some of the designs were just slightly small in terms of width. The most obvious was for my thumb but I have unusually large thumb nails. Also the designs for my middle and pinky nails were just ever so slightly small but it isn't noticable looking at them (see picture below). 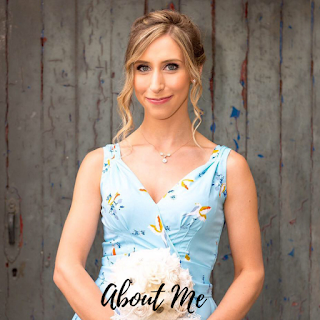 They were a little bit fiddly when positioning them but I think that was more me trying to be a perfectionist and have them straight. On the whole though they were so easy to use and I much preferred them to nail wraps. I LOVE these decals! I will definitely be buying some when these run out. I think they look so cute and make nail art so quick and easy. They are such an amazing price for a great quality product. I love the fact there are a variety of designs so you can mix up how you wear them. 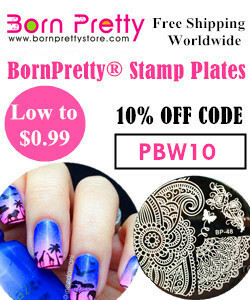 Remember you can use my code PBW10 for 10% off your entire order at Born Pretty Store. I hope you guys liked these! What do you think of the decals?